The rise in intra-region mobility – that is, the increasing incidence of international students leaving their home country to study in a neighbouring country within their home region – is one of the most important trends in international student mobility today. As reported previously on ICEF Monitor, increases in regional mobility are being fueled by improved capacity and quality in regional education hubs, and also by student preference for the greater proximity to home and affordability of regional study destinations. In some parts of the world, this shifting demand pattern is also enabled by ambitious regional mobility programmes, notably the recently expanded Erasmus programme in Europe. Now known as Erasmus+, the programme will provide funding for four million people to study, train, work, or volunteer abroad through 2020. Erasmus illustrates how regional mobility patterns can be greatly accelerated on a foundation of broader economic and political cooperation within the region. And this example makes the recent moves to establish similar systems of mobility among ASEAN states particularly noteworthy. The Association of Southeast Asian Nations (ASEAN) is a political and economic organisation of ten Southeast Asian countries: Indonesia, Malaysia, the Philippines, Singapore, Thailand, Brunei, Burma (Myanmar), Cambodia, Laos, and Vietnam. 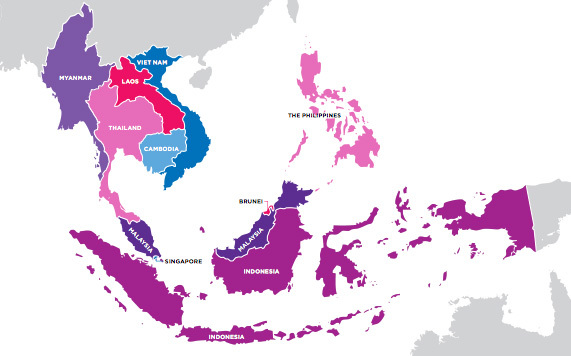 The 10 ASEAN states have a combined population of more than 600 million people. The International Monetary Fund projects annual growth of between 5-6% for the region through 2017, and Boston Consulting Group and McKinsey & Company predict that the middle class income group will exceed 100 million people by 2020.
full integration into the global economy. The ASEAN states have made considerable progress toward these integration goals, particularly with respect to the elimination of intra-regional tariffs. However, many challenges remain and some observers have begun to point out that further steps – particularly with respect to academic links and student mobility – will be necessary still to promote increased trade and cultural links between member states. A statement from The Southeast Asian Ministers of Education Organisation (SEAMEO) notes: “Southeast Asia has been integrating rapidly mainly through trade and investment. The region is also witnessing increasing mobility of people in the region and between regions. This new context places higher education in a pivotal role in developing human resources capable of creating and sustaining globalised and knowledge-based societies. In order to facilitate students’ mobility, the region’s diverse higher education systems need harmonised standards and mechanisms for permeable and transparent quality assurance and credit transfer among institutions. Encouraging and supporting students to study abroad is a major strategy to develop a well-trained international workforce, which can improve the quality and quantity of human resources. SEAMEO clearly sees improved quality assurance and cross-regional credit transfer systems as key building blocks for greater student mobility within the region and otherwise. In fact, ASEAN states are currently working on a strengthened credit transfer protocol that will include ASEAN members plus Japan and Korea, the first aspects of which may be adopted as early as this year. The article goes on to explain that in Malaysia and Thailand, local institutions and their partners will recognise students’ credits, but in Myanmar, credits can only be transferred within the country, not abroad. And in Vietnam, it is nearly the opposite: students can more easily transfer credits between international partner universities than between domestic institutions. While work continues on the critical issues of quality assurance and credit transfer, the region has taken its first steps toward more widespread mobility programmes. SEAMEO, for example, operates the ASEAN International Mobility for Students (AIMS) programme. AIMS traces its origins to a 2009 pilot of Malaysian, Thai, and Indonesian universities. The programme has expanded quickly in the years since to include seven member countries, seven study fields, and 59 participating universities throughout ASEAN. Similarly, the Passage to ASEAN programme represents an interesting, early collaboration among ASEAN universities and a further effort to promote greater student mobility within the region. Passage to ASEAN provides virtual tour and game opportunities for students online and also coordinates affordable study tours among ASEAN countries. These programmes represent some of the first steps toward greater mobility within the region, and future patterns of mobility within ASEAN will now depend on the success that member states achieve in establishing true regional systems for quality assurance and credit transfer. The formation of the ASEAN Economic Community is another important underpinning for this work, all of which will no doubt provide a foundation for additional international links between students and institutions in ASEAN and study destinations further afield. This entry was posted in Agents, Asia, Higher Education, Indonesia, Malaysia, Most Popular, Philippines, Regions, Singapore, Thailand, Vietnam, Vocational and tagged Trend Alert, Most Popular, universities with international students, colleges with international students, tertiary education overseas.